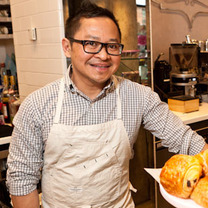 Pichet Ong is the pastry chef at Maketto. Eating and cooking are his hobby and heartbeat. A creator of whimsical sweet and savory foods, he combines the fond flavors of his childhood with modern cooking techniques to create culinary offerings that are seasonal, pure, light, and delightfully experimental, yet nostalgic. My favorite bird - squab. "Finally got to have that @#picoftheday"
"House made pickled vegetables and fix your own bao"
"It’s like breakfast pastry deep dish pizza"
"Perfect for summer dinner in the Maketto courtyard"
"New summer ice cream cake at Maketto: banana cake, brown sugar semifreddo, white chocolate mousse, toasted hazelnuts, and salted caramel drizzle."